At Easirent Gatwick Airport we have a large selection of hire cars all ready for collection. My name is Dan and with my team we look forward to seeing new and existing customers to our Gatwick car hire branch. From small to medium sized family cars or large executive business vehicles; we have the right car for all requirements – book direct online today for the lowest Easirent price. 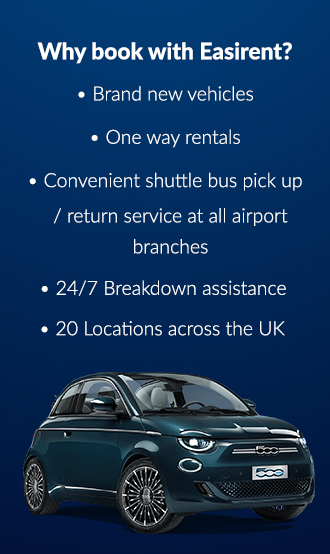 We have car rental branches located all over the UK including Heathrow Airport, Stansted Airport and Central london. Please note: The airport shuttle operates every 45 minutes. If you have just missed it, you can call the branch and they will aim to pick you up within 15 minutes. Arriving at Gatwick Airport by train. The nearest stations to our Gatwick branch are located at Gatwick Airport, Ifield and Crawley. Local taxi services are available to transfer you from the station to our branch. Travel to London Victoria in only 30 minutes via Gatwick Express or take a direct train to Brighton. Arriving at Gatwick Airport by bus. Most services operate from the lower South Terminal forecourt. Dropping off your car at Gatwick Airport. Please return the car to the Crowne Plaza and take the shuttle bus to the airport. Many of our hirers wish to drop off their hire car to one of our other branches. We have a growing branch network that enables our customers to return their hire car to another Airport location if this is more convenient. A popular one way car hire option from Heathrow Airport is to Gatwick Airport. One way car hire is often cheaper than other means of travel such as a taxi service. This premier lounge area is perfect for both business and leisure passengers. It has premium facilities that make your pre-flight experience both relaxing and enjoyable. Feeling hungry? Enjoy complimentary food, freshly prepared just for you. Order a refreshing drink from the bar both alcoholic and soft drinks are available. Amazing views of Gatwick runway. Connect your devices freely to Gatwick’s fast WiFi service. Relax by watching the latest news or live sports on big screens located throughout the lounge. Pick up your favourite newspaper or magazine. Need to do some office work on the go? The Lounge has full printing, scanning and fax facilities. Order before you arrive at the airport and enjoy a saving of £7 (£28 pre book price) compared to the on the door price of £35. Buggies for hire: Travelling with young children and need the use of a pushchair while you wait for your baggage? Gatwick has a free buggy hire service which are situated throughout the arrival zones. Help for Families: Gatwick recognises travelling with small children can be stressful so they have introduced family lanes to help with security checks for departures and arrivals. Look out for the special assistance signs after check in. Kids Zone: With the Gatwick Airport Kid Zones children can let off steam in a fun and safe area designed especially for kids! Free to access, the Kids zone has lots of seating space for parents and TVs too! There are two Kids Zones, one in the upstairs area of South Terminal and the second, close to Boots store in North Terminal. Baby changing facilities: Families with young babies will be reassured to know that Gatwick has full baby changing facilities located throughout the airport. Look for the “bottle” sign or “babycare” symbol and you can find the rooms close to check in kiosks, near flight gates, transfer zones and after passport control checks in the arrival lounge. Please note that some ladies and gents toilets also have fold down tables available to use. Internet access: Your mobile device or laptop can pick up free Wi-Fi at Gatwick airport (for a limited time of 90 mins). To access, go to your device settings and select the “Gatwick FREE Wi-Fi” follow instructions on your web browser to connect. After 90 minutes you can pay for a premium internet access service through local provider, Boingo. There are also many charging points located throughout the airport, available free of charge to use.